This consultation is no longer running. Thank you to those who have taken part. Please check our website (www.mansfield.gov.uk) where the results of this consultation will be published soon. This will open the Budget Simulator. 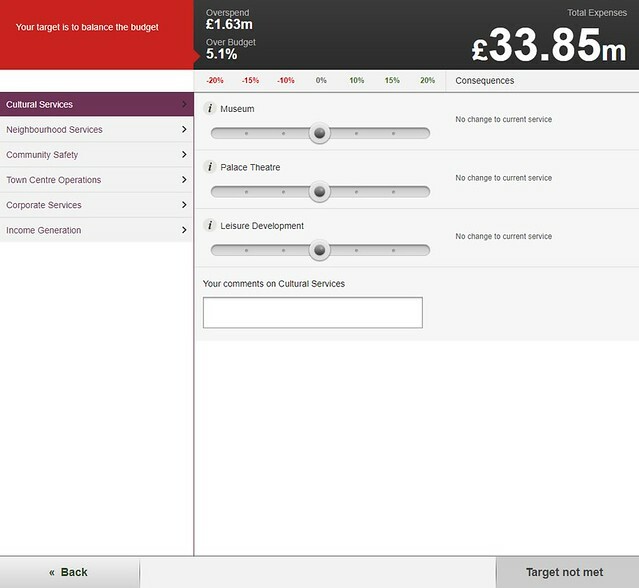 The Budget simulator includes six main areas for consultation which can be found on the left hand side of the page from ‘Cultural Services’ to ‘Corporate Services’, with an area for income generation. The top banner shows the savings target represented as an overspend of £1.63m, your target is to reduce this to £0, which will in turn mean that you will be 0% over budget. Moving the sliders to the left will reduce the budgets of each of the service areas which will lower the overspend shown in the banner. Moving the sliders to the right will increase the budget of the service and will increase the overspend shown in the banner. Consequences of any increase or decrease in budget will be shown to the right of each slider. Your target is to move the sliders involved in the Budget Simulator so that the overspend is zero and that you are happy with the resulting consequences of any adjustments. You will also be able to provide any additional comments that you wish to make for each of the main service areas. The income generator works slightly different to before. In addition to the increase/decrease percentages being different, moving the slider’s left here will decrease the charges for each of the services, which will increase overspend. 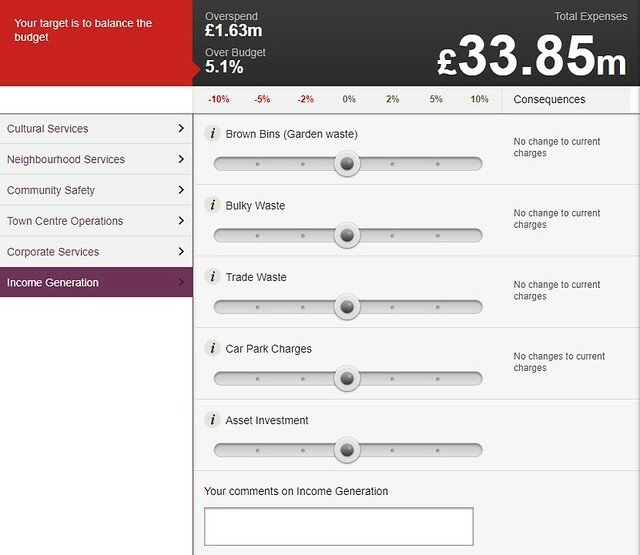 However, moving the sliders on the income generator to the right will increase the charges, this will in turn reduce the overspend. Similarly for the asset investment, sliding to the right here will increase the amount of money which MDC spends on Asset Investment, which in turn will increase the amount of income which we have available. The income generator gives you the option to increase the amount of money MDC generates by raising fees and chargers, or increasing the funding which is put in to Asset Investment. This will reduce the overall overspend, or provide you with more money to fund into other services. Once you have balanced the budget, the banner at the t op left will turn green and the bottom right button will change to ‘Review and Finish’. Pressing the ‘Review and Finish’ button at the bottom left will then take you to a page which gives you a chance to look over the choices you made during the simulator and give you the opportunity to make any further comments. Once you have checked this and you are happy with your selections, please select “Submit budget” at the bottom right. This will then take you to the final page before completing the budget simulator. 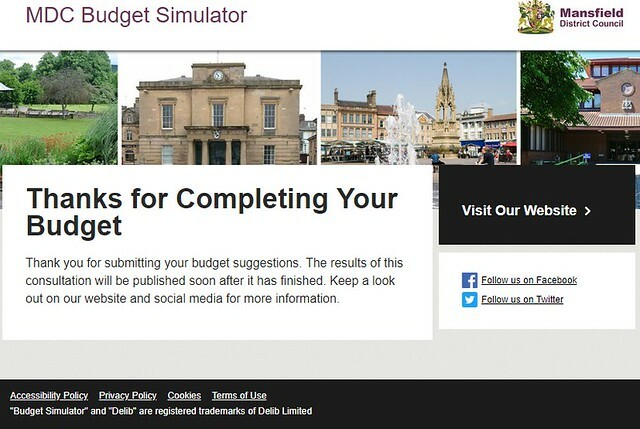 The budget simulator will then ask you to anonymously submit your age group for statistical purposes. However, providing this answer is optional, but you will still need to select ‘Continue’ in order to submit your budget.